Stevie Nicks was in a chatty mood Saturday night at Vivint Smart Home Arena. Maybe it was because the rock icon was back in her onetime hometown of Salt Lake City. Maybe it was because she was excited to return to the road for the bonus round of her "24 Karat Gold Tour," with this show being just the second in a 20-date tour extension that kicked off Thursday in Reno following a two-month break. Maybe it was a side effect of the Gold Dust Woman's desire to sprinkle intimate insight and detail into the background of nearly every tune in her 18-song set. Whatever the reason, Nicks split her two hours and 15 minutes on stage between singing and sharing stories from behind the music of her illustrious 44-year recording career. And you know what? Give us more shows like this -- ones where it's as if the artist is standing in your living room and carrying on a musical conversation at their own relaxed pace rather than punching some imaginary time clock monitoring exactly when they need to be off stage. Nicks even joked about her gift of gab late in the performance. "There's too many stories in my life," she said, before laughingly considering what her concerts might morph into another five or six years down the road. "Pretty soon, there won't be any music. It'll just be me sitting in a chair talking. It will be the cheapest show ever. I won't even need a band." As bands do go, Nicks has always managed to surround herself with some amazing musicians, whether on stage or in the studio, a fact that was never more evident than it was Saturday night -- both in terms of live performance and with her revelations into each song's background. This has been true since she broke into music as a duo with partner/guitarist Lindsey Buckingham, continued on with that pair's tenure in Fleetwood Mac, and been a constant throughout her solo career as well. Some of her best stories revolved impromptu recording sessions with Tom Petty's Heartbreakers and Prince, among others. Both Prince and Tom Petty had notable influences in Saturday's set. Nicks told of how she wrote one of her biggest hits, "Stand Back," on her lone wedding day, literally working through her honeymoon night on it, after hearing Prince's "Little Red Corvette" on the radio for the first time. Recognizing Prince's influence on the song, she later rang him up from Sunset Sound studios in Los Angeles to seek his permission to finish the track. He happened to be in town and showed up at the studio 15 minutes later, as Nicks said, "Dressed to the 9's in purple," to hear what they'd recorded. "If you hate this, it's over, we will throw it in the trash right now,' " Nicks said she told Prince. "(But) he loved it. I said, 'Would you like to play on it?' And he said yes." In true rock star fashion, Prince had brought a guitar with him in his car. He added some guitar and keyboards to the final track. "Now when I sing it, he's right here," Nicks said, motioning just to her side on stage. Nicks' collaboration with Tom Petty and the Heartbreakers is more obvious, since the band literally helped catapult her solo career with the duet "Stop Draggin' My Heart Around" in 1981. Short of T.P. and the Heartbreakers personally showing up, it's hard to imagine a more spirited version of the tune being performed live than this tour's rendition. As she has been doing all tour, Chrissie Hynde, frontwoman of opening act The Pretenders, walked into the "Stop Draggin' " party like she was walking onto a yacht, strolling confidently out to thunderous applause during the first verse. There was so much genuine interaction between Nicks and Hynde, as well as guitarist Waddy Wachtel, that it was blatantly obvious how much fun everyone was having. In the grand tradition of concert "walk-ons" -- where artists from other bands on the bill make a guest appearance in another's set -- the best ones tiptoe the tightrope between rehearsal and spontaneity. In this, "Stop Draggin' " was a huge early-set success. Although planned, it seemed to catch most of the crowd by surprise. Additionally, whether true or not, it appeared as if Nicks and Hynde almost decided on the fly who would take some of the lead vocal lines. Nicks alluded to that after the song, saying that with so many singers -- five in this song, counting Wachtel and full-time backup singers Sharon Celani and Marilyn Martin -- it is hard to keep track of who, exactly, is supposed to sing what. "You tried your hardest just to smooth it over," Nicks laughingly said to Wachtel after the song, "but you just couldn't do it." Wachtel, who in addition to lead guitar duties is also the band's musical director, has been with Nicks from the start. He literally performed as a session musician on the "Buckingham Nicks" album in 1973 that led to duo's destined decision to join Fleetwood Mac the following year. Wachtel has played on every one of Nicks' solo albums and tours, and his performance -- not to mention his wild frizzy hair -- also figures prominently in the band's live show. Nicks' latest album, "24 Karat Gold: Songs From the Vault," provided the perfect template for her strong storytime approach. The album features a collection of songs that Nicks wrote and recorded over the years that for some reason never quite fit musically or timing wise into any of her other projects. Over time she metaphorically placed them in her "gothic trunk of lost songs." She played three songs from that album -- "Belle Fleur," "If You Were My Love" and "Starshine." The latter song, which Nicks co-wrote and recorded with Petty and the Heartbreakers (she thinks around 1979), certainly sounded like it could have been a vintage single for either of them, and helped drive home the sometimes fickle nature of the music industry. "I wasn't doing a record (at the time) and he wasn't doing a record," Nicks said. "If either of us had been doing a record, it would have been on it. So it went into the gothic trunk of lost songs." Nicks' set was extremely well paced in terms of song selection and running order. She could have filled the entire show with hit singles -- but to her credit, she didn't. She only played four Fleetwood Mac songs, and branched out into much of her lesser-known solo material as well. In less-capable hands this might have been a bit of a gamble, but it was no threat to a Rock and Roll Hall of Famer of Nicks' stature. To be sure, Nicks did scatter hits occasionally throughout the show, before backloading it with four songs guaranteed to garner a great reaction. An especially intense 10-minute version of "Gold Dust Woman" set the beginning of the end in motion. That was followed by the main set-closing "Edge of Seventeen." The encore featured "Rhiannon" and "Landslide," two songs from her Fleetwood Mac debut. Nicks noted that she has sang both those songs every single performance since they were written. "I wrote this song in Aspen," she said of "Landslide." "I wish I'd written it here." Nicks owned the crowd from the moment she walked on stage in her trademark platform heel boots, flowing black dress, black fingerless gloves and an ever-changing array of scarves, shawls, jackets and capes. One such cape, by the way, was the silk chiffon one she wore on the "Bella Donna" album cover. The cape, she said, cost her $2,000 in 1981 and remains in perfect condition today. She laughed considering what her mother would have said at paying that initial exorbitant price tag. "(But) $2,000 over 35 years is a very good price," Nicks noted. That's very likely the sentiment anyone in attendance Saturday night will have years from now when they look at the price on their ticket stub. Seeing someone of Nicks' legend, caliber and overall talent, still performing at a very high level, is not an opportunity to be missed. You simply can't put a cost on gathering memories like that -- or missing out on them. Adding to the value of the night's entertainment, The Pretenders, also a R&R Hall of Fame act, performed a tight 15-song, one-hour set. The band showcased both new and old material along with well-known hits "Back on the Chain Gang," "My City Was Gone," "Middle of the Road" and "Brass in Pocket." Pretenders frontwoman Hynde runs the show, naturally, along with the animated efforts of lead guitarist James Walbourne, original drummer Martin Chambers, and the more laid-back efforts of bassist Nick Wilkinson and keyboardist Ricky Peterson. Peterson deserves special notice for pulling double duty, as he also is a member of Nicks' touring band. In one sense, Nicks and Hynde are polar opposites. Hynde, rocking her signature fringe mop hairdo, hit the stage in skinny jeans, a T-shirt and a short-waisted pink tuxedo jacket, which she removed six songs in. 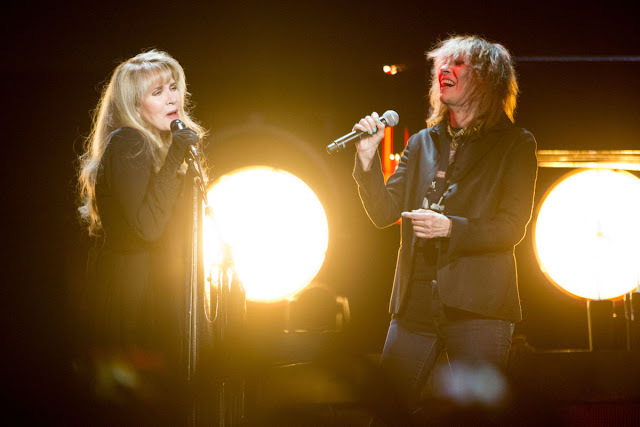 But in another sense, Nicks and Hynde are kindred spirits who can rock with the best of them. As unlikely as it sounds, there are fewer sights more pure rock and roll than seeing the statuesque Hynde, bent at a three-quarters side angle, jamming on a harmonica with her Fender Telecaster slung behind her back during the end of "Middle of the Road." Perhaps you had to be there. On any other night, The Pretenders would have been the talk of the town. In this tour, however, Nicks gets the final word. "She was magical. 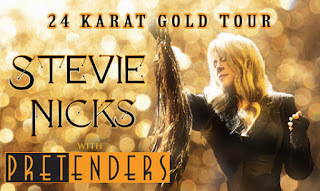 Make sure you put that in your write-up," my wife insisted upon leaving Saturday's Stevie Nicks concert at Vivint SmartHome Arena in Salt Lake City. She had a point. How else to explain an artist I had no particular affinity for prior to entering the building delivering two and a quarter hours of the best concert-going experience of my adulthood? Magic seems as good an explanation as any. OK, so you could argue that many of the live performances — bolstered by two guitarists, a bassist, drummer, Hammond organist, grand pianist, two female backing vocalists, and the occasional Nicks-shaken tambourine — were infused with a depth and energy that isn't always apparent (to me, anyway) on her recordings. That hardly tells the whole story, though Nicks proved quite adept at just that, often preceding or following the tunes that comprised the night's setlist — many pulled from her "gothic trunk of lost songs" — with meandering, colorful and humorous tales. • Her two-plus years growing up in Utah: "My parents threatened to send me to that Catholic [high] school downtown if I didn't get a B-plus average [at Wasatch Junior High]. … That place turned out to be a lot fun! It was coed! I didn't brag about it 'cause I knew they'd whip me out of that school and put me in a convent." • Her humble pre-Fleetwood Mac career: "I was still a waitress and a cleaning lady, and I had a Toyota Corolla with no reverse. And all of a sudden I'm flying first class and riding in a limousine — something I never thought I'd do unless I was the one driving it." • Her expensive-yet-theoretically-practical fashion proclivities: "This is the original 'Bella Donna' cape. My mother, if she were standing here, would fall over if she knew how much it cost. It was $2,000! It's made of silk chiffon! … But look at it — not even a loose thread anywhere. So, you take $2,000 and spread it over 30-something years … now, all of a sudden, if my mother was standing here today, she would say, 'That was a very good choice of fabric!' "
Nicks also spun yarns of having to promise not to break up Fleetwood Mac in order to make her first solo record (but giving her label a panic attack by quasi-joking that what she really wanted to do was join Tom Petty and the Heartbreakers), having nothing to do one night in Brisbane, Australia, and winding up "thoroughly and completely in love with the love story of Bella and Edward" after getting sucked into the first two "Twilight" films, and meeting a young Prince sometime between 1975-77 "when hardly anyone knew who he was" and remarking to him, "You don't say much do you? You need to talk a little more." Of course, Nicks also has a way with words in her songs, and she proved equally enchanting there over the course of her 18-tune setlist, which included four selections apiece from Fleetwood, 1981's "Bella Donna" and 1983's "The Wild Heart," three from the 2014 rarities collection "24 Karat Gold," two from 2011's "In Your Dreams," and even one from her original "Buckingham Nicks" album from 1973. She got the crowd rolling early by having The Pretenders' Chrissie Hynde trade lines with her on her Petty duet "Stop Draggin' My Heart Around" (with guitarist Waddy Wachtel taking on Petty's parts). Other highlights included the ethereal, "Twilight"-inspired "Moonlight (A Vampire's Dream)," the unexpected electro rave-up "Stand Back" (an offshoot of Prince's "Little Red Corvette"), and the main-set closer "Edge of Seventeen," which had the audience dancing and singing along on all those "Whooooo! Whooooo! Whooooo!"s. Really, though, just about everyone's favorite moments came in her Fleetwood performances. "Gypsy" got the crowd swaying, and the encore included "Rhiannon" and a sparse acoustic guitar and piano arrangement of "Landslide," but perhaps the singular moment of the entire evening was the hypnotic-and-transfixing-yet-swaggering run through "Gold Dust Woman." Hynde and The Pretenders opened the night with a no-frills hour of straight-ahead rock, starting off a bit flat before settling in and catching a groove around their fourth song in. Her mid-set trifecta of "Back on the Chain Gang," "I'll Stand By You" and "Don't Get Me Wrong" would've been her inarguable highlight if not for her rousing, set-closing edition of "Brass in Pocket." When The Pretenders wrapped up, Hynde told those assembled, "Stevie will be on in about 20 minutes. Don't go anywhere!" Great advice — unless, of course, you'd simply already had too many magical moments in your life.